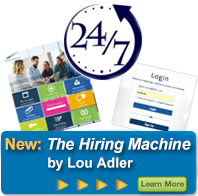 Permission has been granted from The Adler Group and Lou Adler, author of Hire With Your Head and The Essential Guide to Hiring & Getting Hired, to summarize this article. Here's the link to the original article - [link]. Let us know where the content will be printed. Send a quick email to info@louadlergroup.com with the name and date of the publication in which the reprint will appear. If you have any questions regarding the reprint policy or procedures, please contact The Adler Group at 949-612-6300.